Hair loss may be caused by a number of factors, which is why Gadal 's efficacy may vary greatly from person to person. For men: New hair growth is less probable after the age of 45. However, hair loss can still be minimized. Younger men may even experience an improvement in hair density, with new hair growth commencing in as few as 12 days from the initial treatment. For women: The phenomenon of female hair loss appears most often from late autumn to spring. However, treatment should not begin and end at these times because by the time hair begins to fall, the associated follicles had in fact begun to weaken and deteriorate for at least a month prior. As a result, if one only begins using Gadal as a treatment for already-occurring hair loss, the cessation of hair loss will only become noticeable after about a month. This is why it's recommended to use Gadal from September through March, i.e. a month more on either side of the hair loss season. Gadal can be used throughout the year to stimulate new hair growth, which can take place within 12 days of initial treatment. For both men and women it is highly recommended to consume Herbs of Kedem's detox tea Nikuzit to increase the efficacy of the treatment. Lavender: calms, soothes irritation, relieves, stress, has anti-aging properties, tones, promotes circulation, revitalizes, is a natural antioxidant, and reduces dandruff. Rosemary: reinforces the immune system, is a natural antioxidant, stimulates, has anti-aging properties, improves circulation, revitalizes, stimulates hair follicles, and prevents premature hair loss. Italian Helichryse: is a natural anti-inflammatory, promotes new cell growth, has anti-aging properties, regenerates, calms, and promotes circulation. Suggested Usage: Apply to hair and massage the lotion into the scalp 2 times a day (morning & evening) until Gadal is fully absorbed. Sometimes you'll experience a warming sensation. This is due to an increase in circulation to the scalp. Avoid rinsing your head for a few hours. When washing your hair, it is recommended to reduce the use of shampoo & to limit the amount of washing to 2 times a week. Cessation of hair loss can be seen after 30 days of treatment, while new hair growth can be seen within 12 days. Drinking Herbs of Kedem's Nikuzit detox tea is recommended for optimal results. 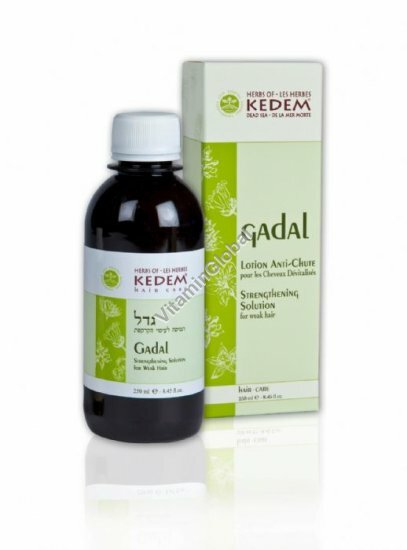 Gadal has been dermatologically tested, and not tested on animals. This product is not a medicine and is not intended to replace medical treatment. Women who are pregnant or breastfeeding, people taking prescription medications, and parents considering this product for their children should first consult a physician.